If you are the parent of a child who has to carry an EpiPen in case of a life-threatening allergic reaction, you were no doubt outraged when the drug’s manufacturer, Mylan, jacked up the price by hundreds of dollars this week. 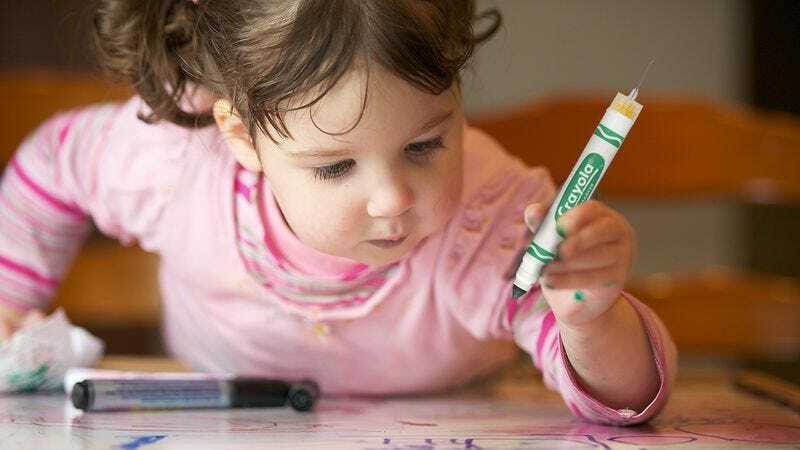 But thankfully, another company is stepping up to the plate to put parents’ minds at ease: Crayola just announced that their markers will now inject kids with a complete dose of epinephrine every time they use them. Wow! Good for Crayola for making this lifesaving drug accessible to all. When the egregious EpiPen price hike made them unaffordable for parents on a budget, Crayola decided to take action. From now on, every one of their markers will have a full dose of the crucial epinephrine housed right next to the ink cartridge. Simply squeezing a marker will cause a 22-gauge needle to activate from the end of it, primed to deliver 0.3 milligrams of the medicine directly into the bloodstream of a child. And it all happens without even having to pause playtime! Incredible! It is so refreshing to see a company put people before profits after one so heartlessly did. Mylan’s blatant price gouging may have deprived some people of epinephrine, but thanks to Crayola, children will now be blasted full of the drug every time they color. Well done, Crayola!